Upon closer inspection of the underside of this settee, it was aparant that it was a modern piece made in the Queen Anne style. 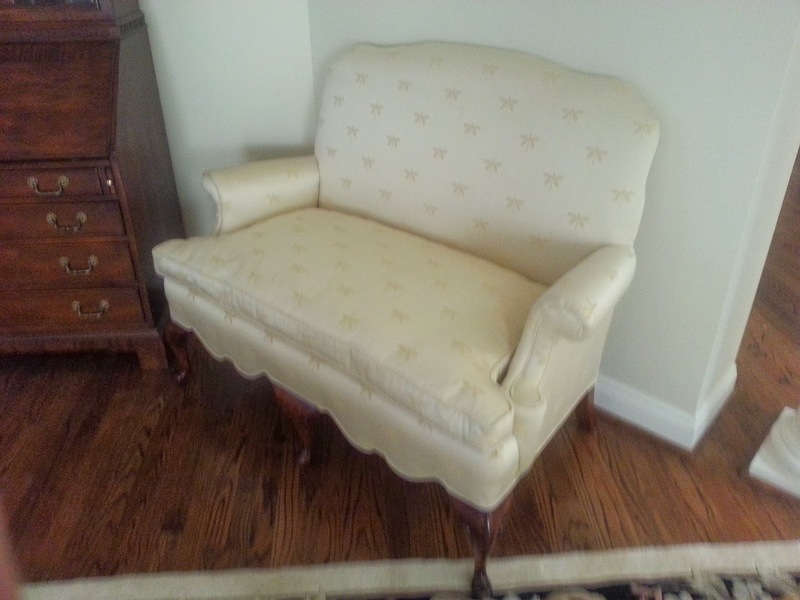 With this in mind, this was a well constructed settee with a nice shaped apron and down cushion. The interior wood used for the frame was poplar placing it's origin in America and the wood used on the legs was mahogany. 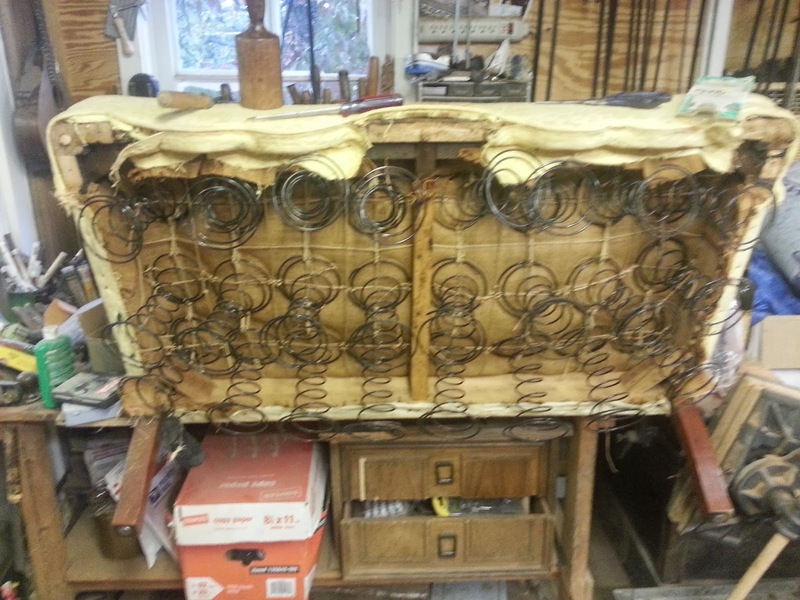 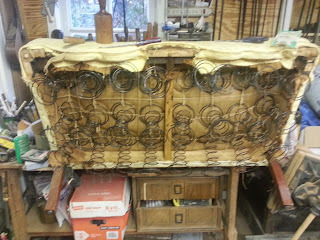 The frame was in good shape but the webbing that held the springs in place had failed causing the seat to collapse. 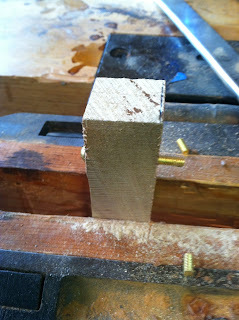 There were also several loose joints, mostly where the front legs attached to the frame. 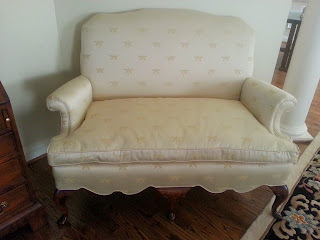 In addition, the fabric need to be replaced and the finish needed to be cleaned and spruced up a bit. 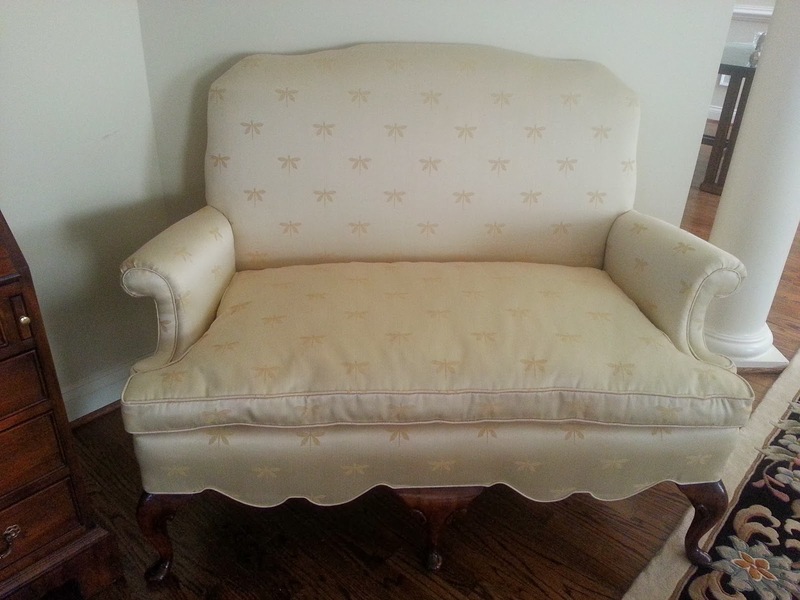 Below are a few photos of the restoration of this beautiful settee. 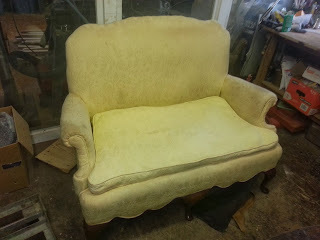 This photo below shows the settee prior to restoration and upholstering. 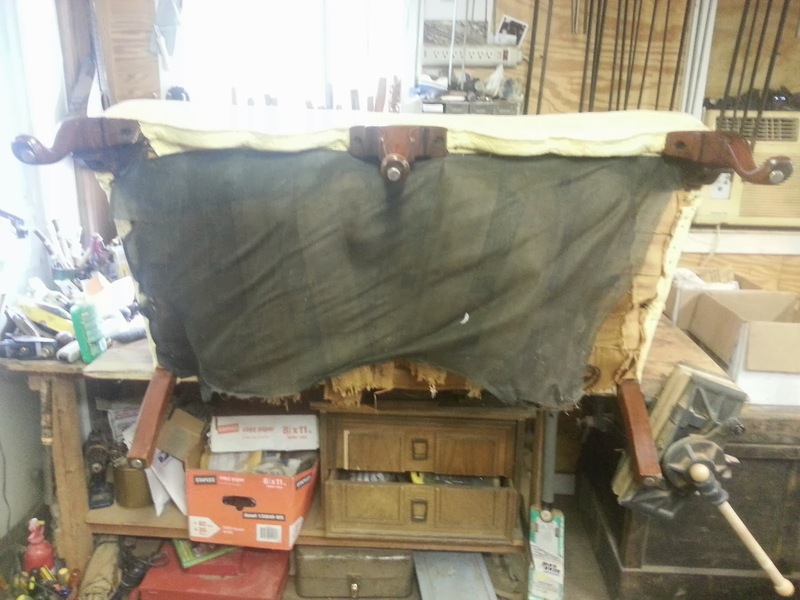 As stated above, the webbing had failed on the underside of the settee as seen here. 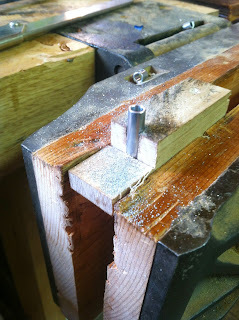 This was a bit of a blessing because by removing it, it be came easier to access the frame from underneath and glue the loose joinery. 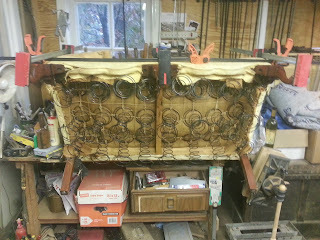 This photo shows the underside of the settee with the webbing removed. The front legs are also removed in this photo so that the old glue could be scraped form the joinery and the legs glued back onto the frame. 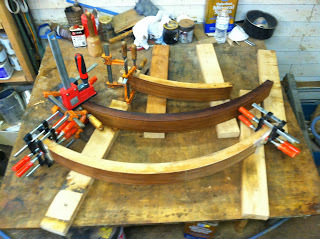 These next two photos show the frame being glued up. 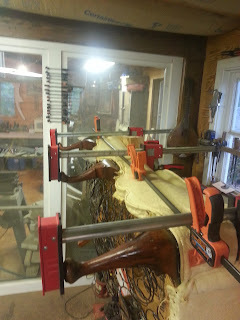 The legs are also being reattached to the frame. 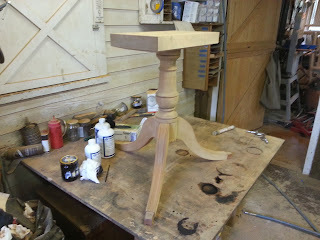 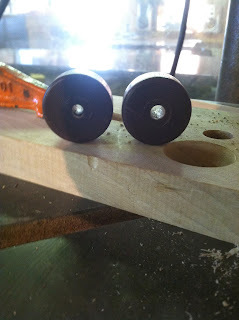 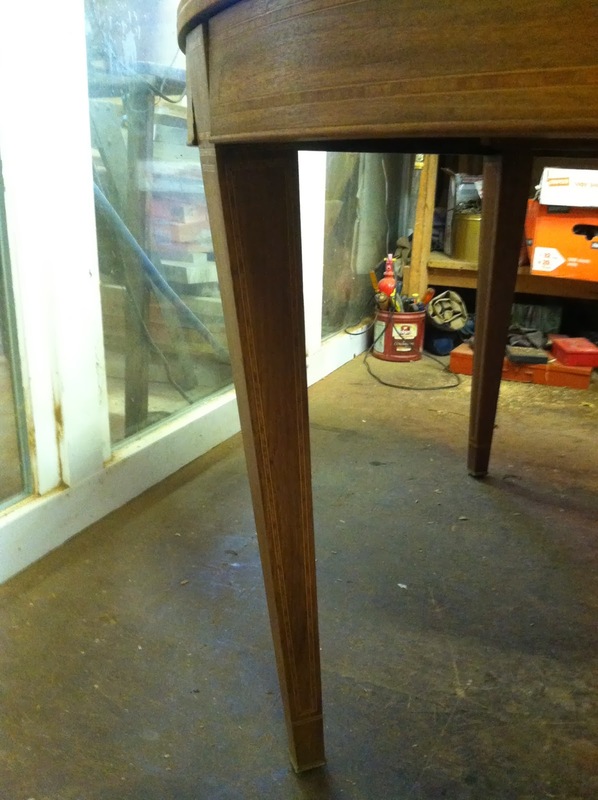 After the repairs were complete, I cleaned the finish on the legs and added some french polish to bring back the finish. 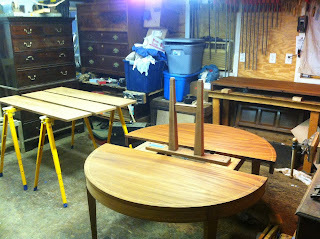 Once all of this was done, it was off to the upholsterer to be upholstered with the new fabric. Below are a few photos of the completed settee. With the holidays comes the inevitable restoration of a dining room table or two and this year has been no exception! 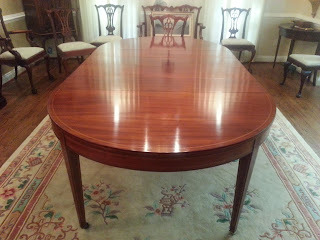 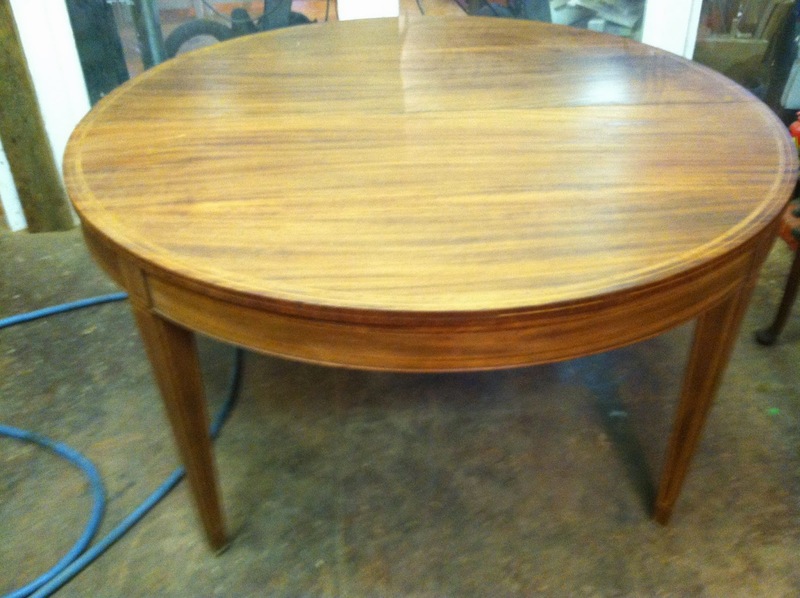 One of the tables we restored before Thanksgiving was this beautiful veneered mahogany dining table. 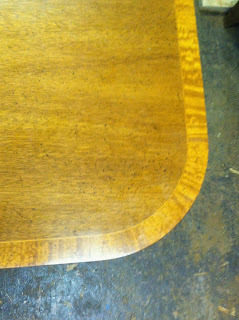 There was no name associated with this table save the name on the slides which was the Watertown Table Slide Company. The Watertown Table Slide Company, of Watertown, Wisconsin, produced table slides for nearly 100 years before being bought by Reiss Industries in 1985. 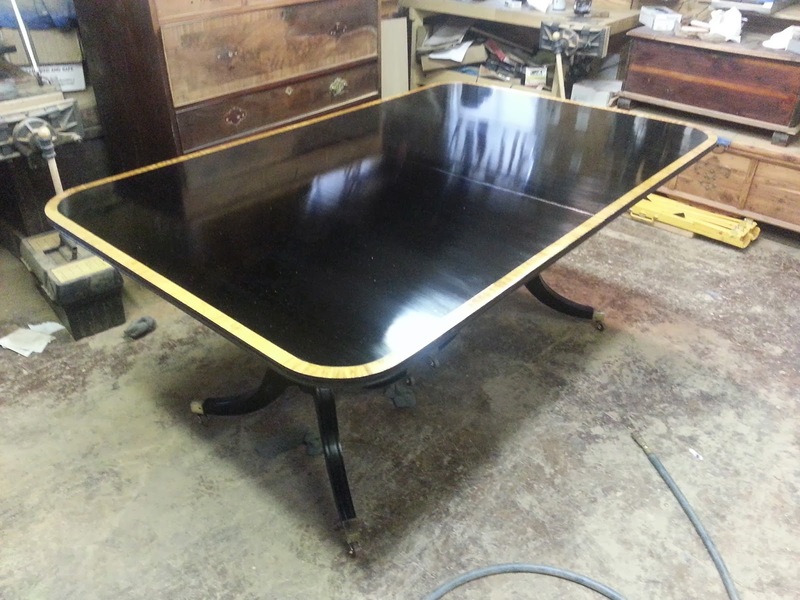 Like Walters of Wabash, the company produced slides for other manufacturers to use in the construction of expanding dining tables. 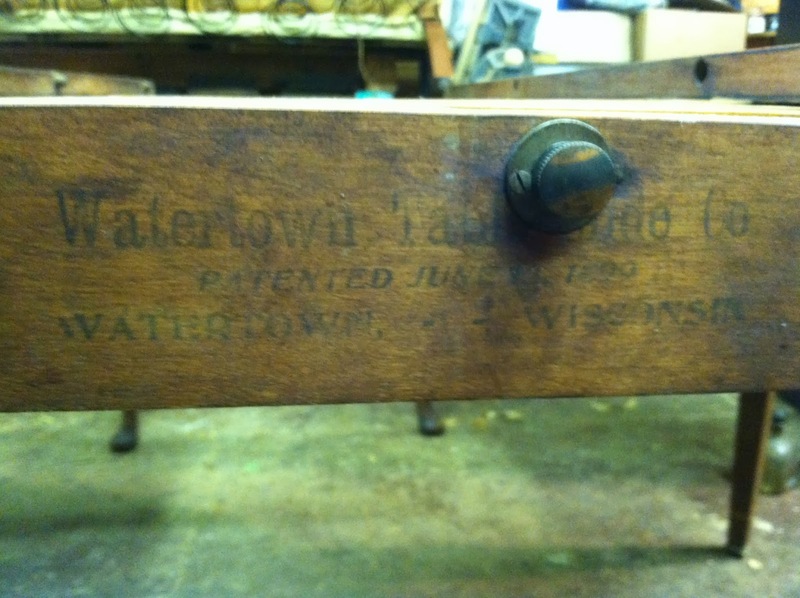 With this in mind, the table itself was not produced by the Watertown Table Slide Company, only the slides. For a look at some history on the company, you can follow the link below. 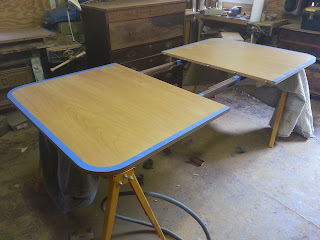 My favorite part is the advertisement stating that the slides work so well that "the gentle effort of a child will extend the table at both ends." 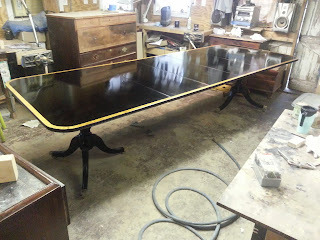 I have yet to meet a table where this is the case, but it is nice to dream! 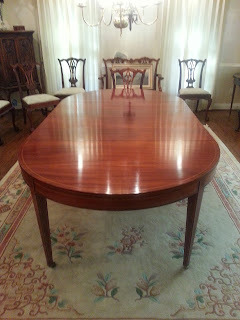 What I can say about this table is that it is a reproduction made in the style of Hepplewhite. 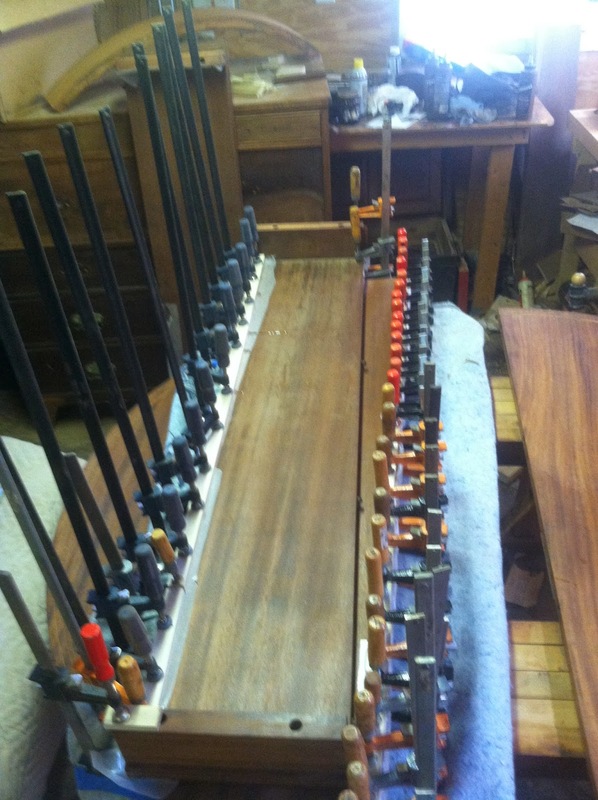 The primary veneer used on this table is mahogany, and the table is inlayed with stringing on all of the primary surfaces, including the legs and aprons. The stringing was made up of a light wood (probably holly) and a wide inner band of tulipwood. A bit of clarification here. 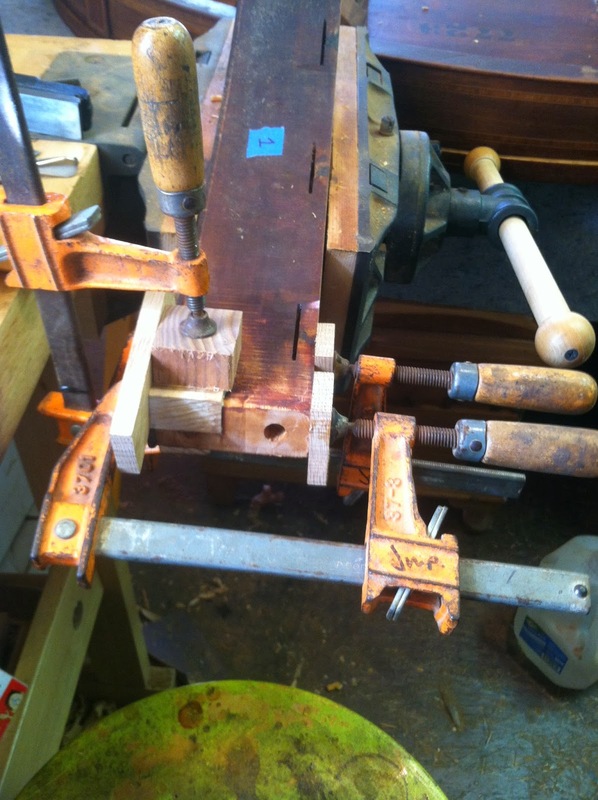 By tulipwood, I do not mean tulip poplar, which is an American hardwood, but a exotic hardwood found in Brazil that comes from the Dalbergia family, the same family that produces rosewood. Tulipwood was used in the 19th century as a banding material much like satinwood. When first cut or sanded, the wood has streaks of pink to red lines with a pinkish white back drop. 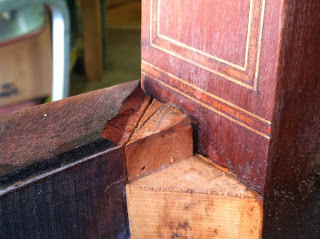 As the wood oxidizes over time the red fades from the wood leaving the streaks brown. 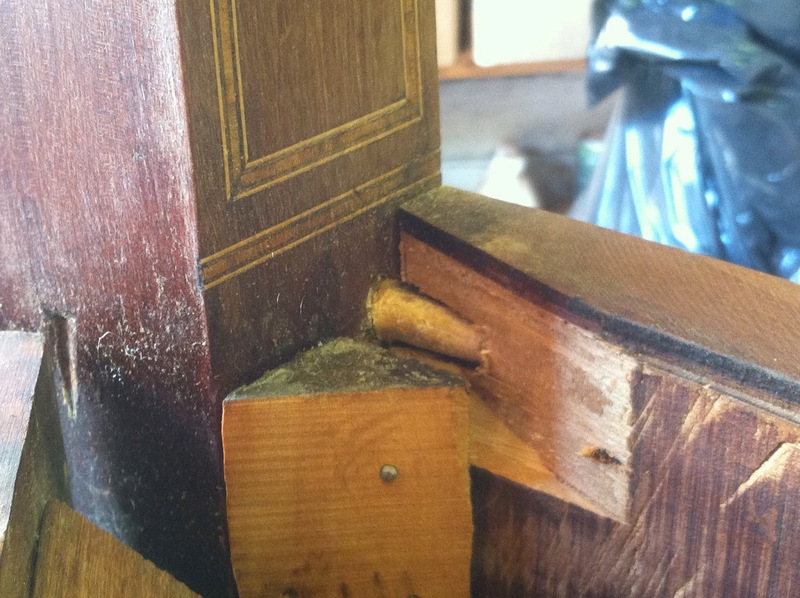 In some cases fading due to sunlight will almost completely mute the varigation. 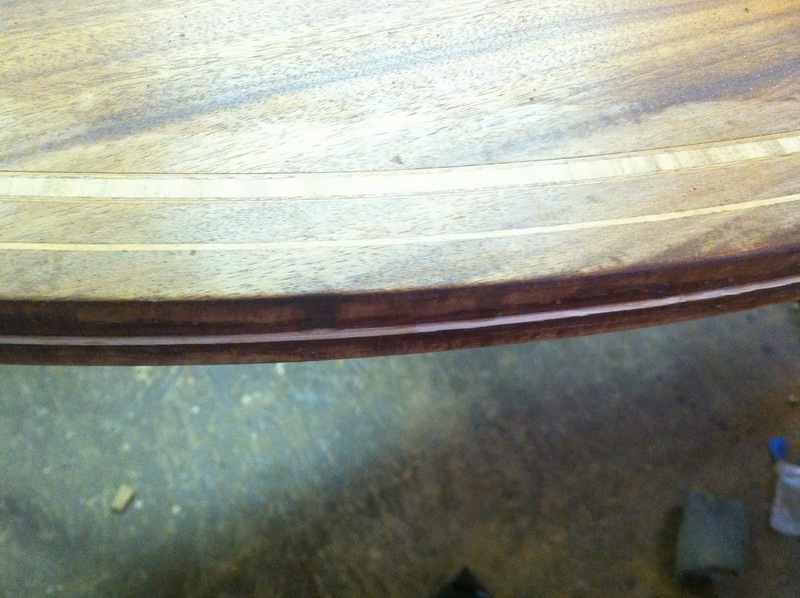 The other woods used in the banding are probably ebony or perhaps some other darkwood. The combination of these woods is quite nice and contrasts the mahogany backdrop accentuating the lines of the table. 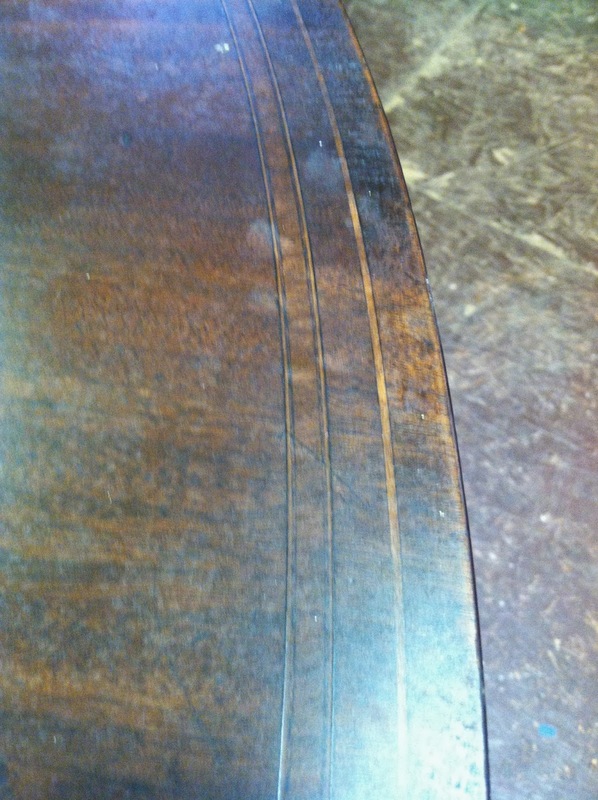 This table had a pretty worn out finish that masked a lot of the design discussed above. 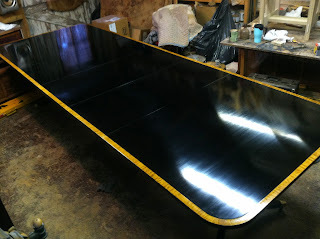 The customer and I decided it would look best with a new finish. 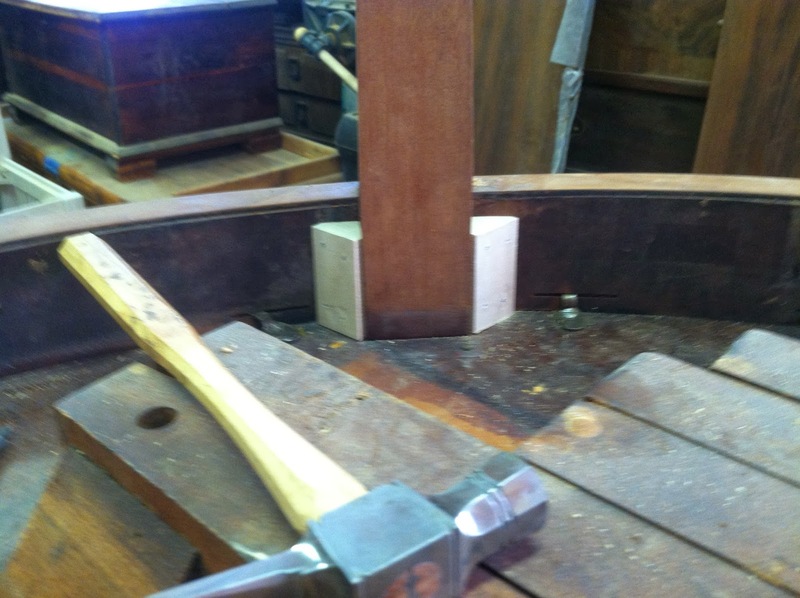 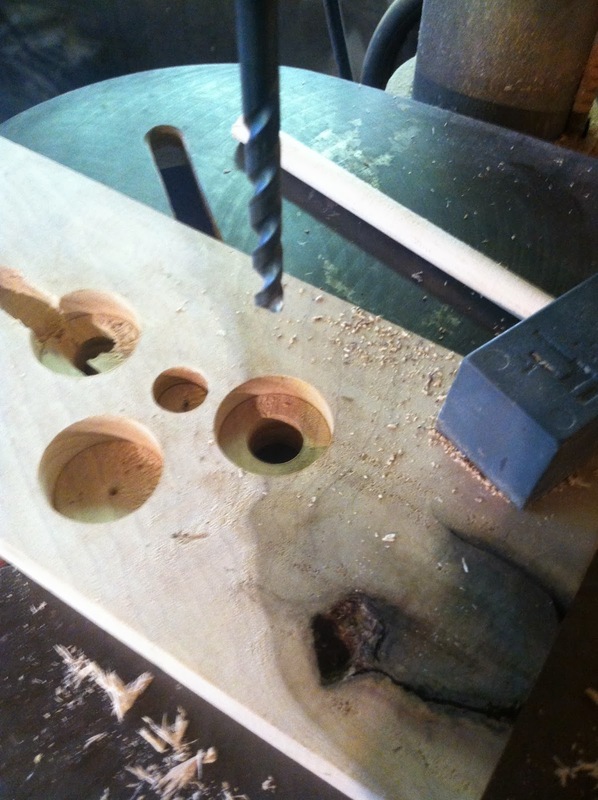 The table was also in need of repair to the joinery of the aprons and base as well as gluing of loose veneer. 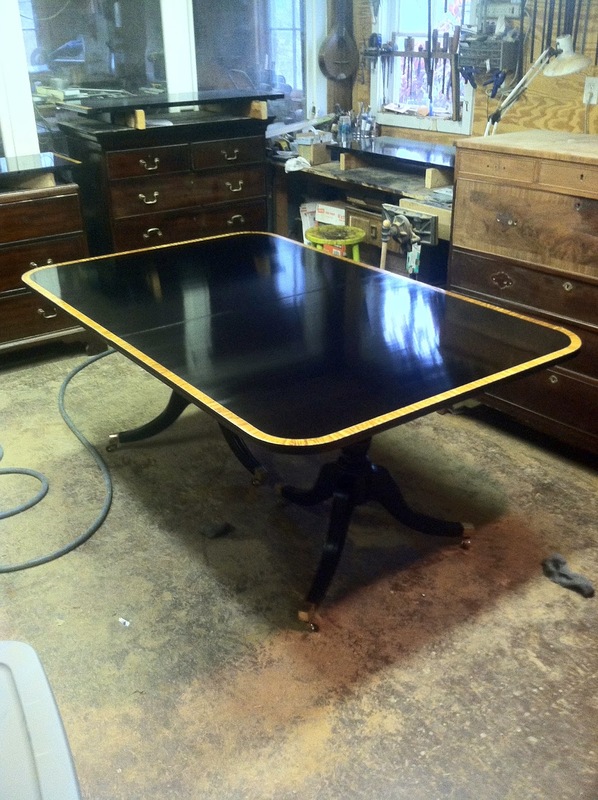 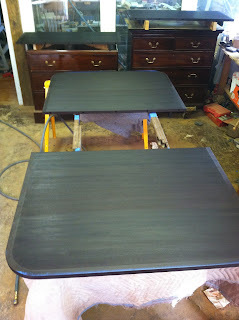 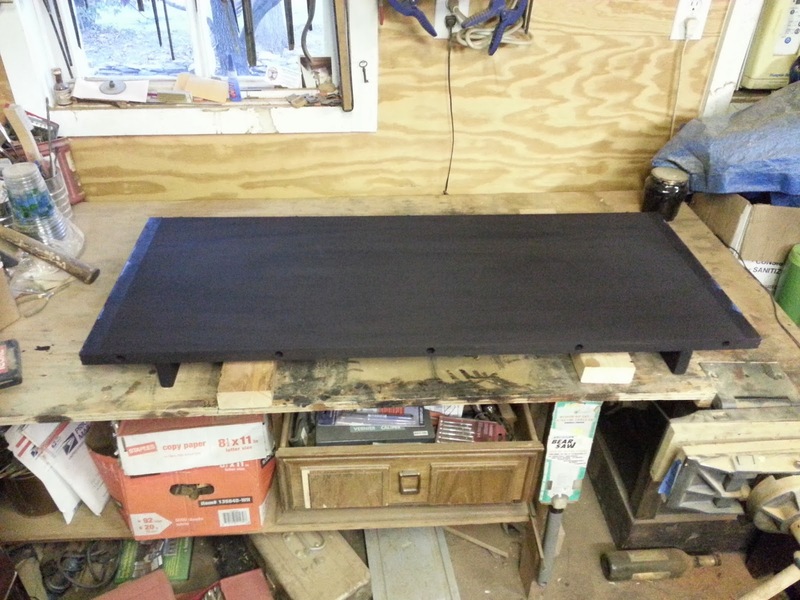 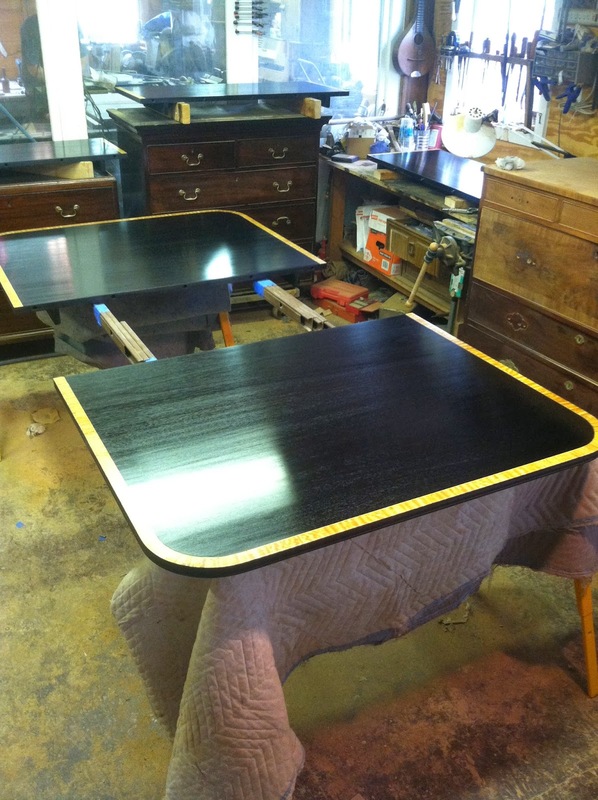 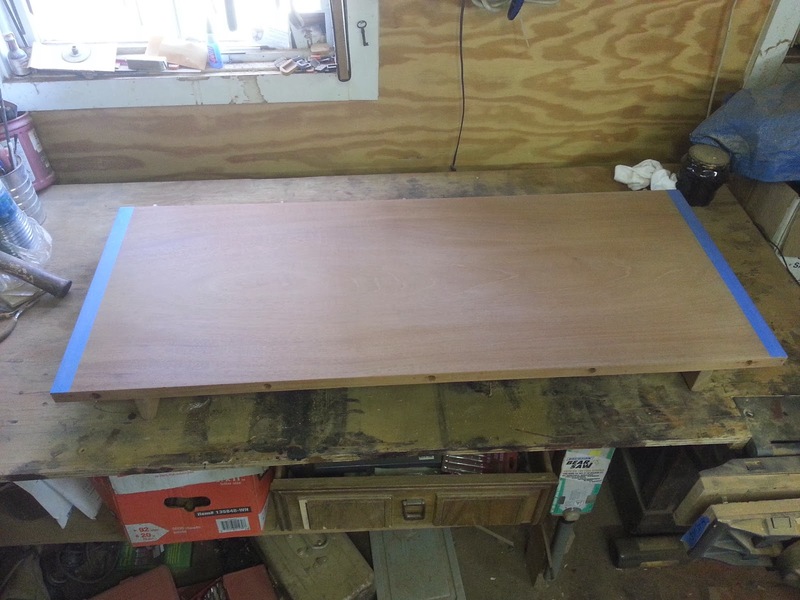 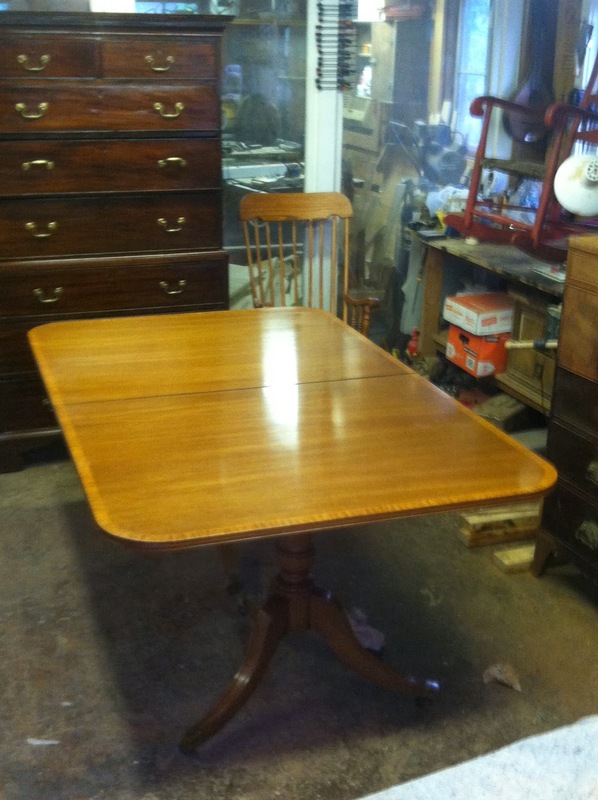 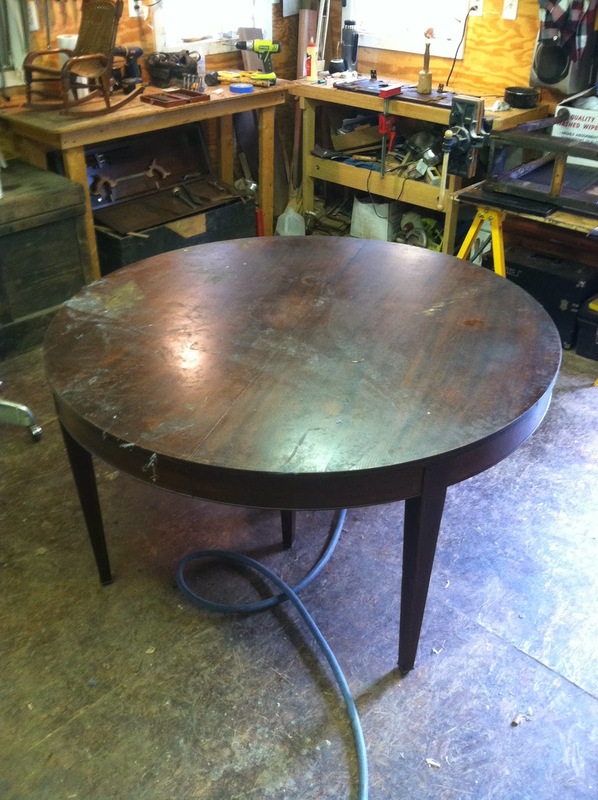 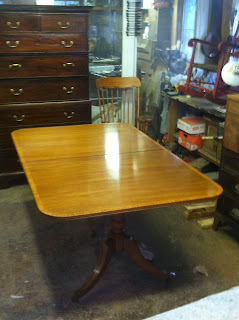 below are some photos of the table before, during, and after restoration. 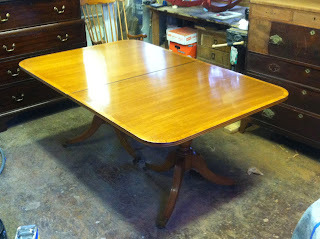 These first two photos show the table before restoration. 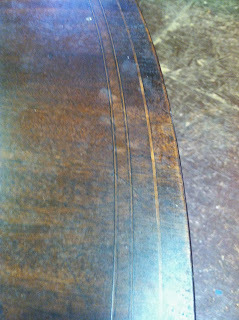 The second photo shows the inlay on the top barely visible through the old finish. This photo shows the stamped label for the Watertown Table Slide Company. 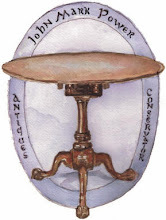 established in 1889. 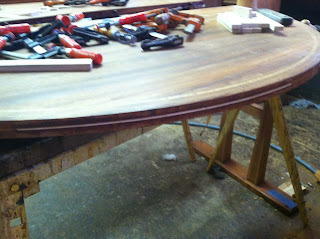 These next two photos show missing section on the interior of the apron where the aprons meet the legs. As the table was moved around over the years the pressure from the legs being moved caused them to bend against the apron causing sections to crack and break out. This photo shows the most severe damage to the joinery. 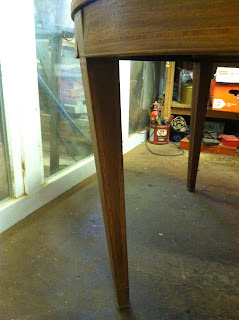 The leg should be vertical, but instead is skewed inward. 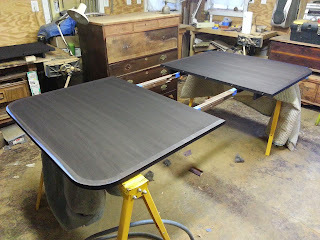 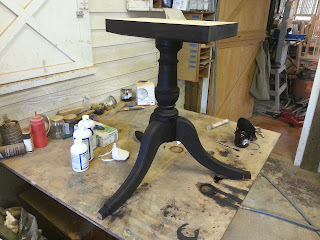 To repair this damage, the legs and aprons were removed from the top of the table. The top can be seen top down in the photo below. All of the joinery was disassembled and cleaned of its old glue and missing sections were patched with wood. 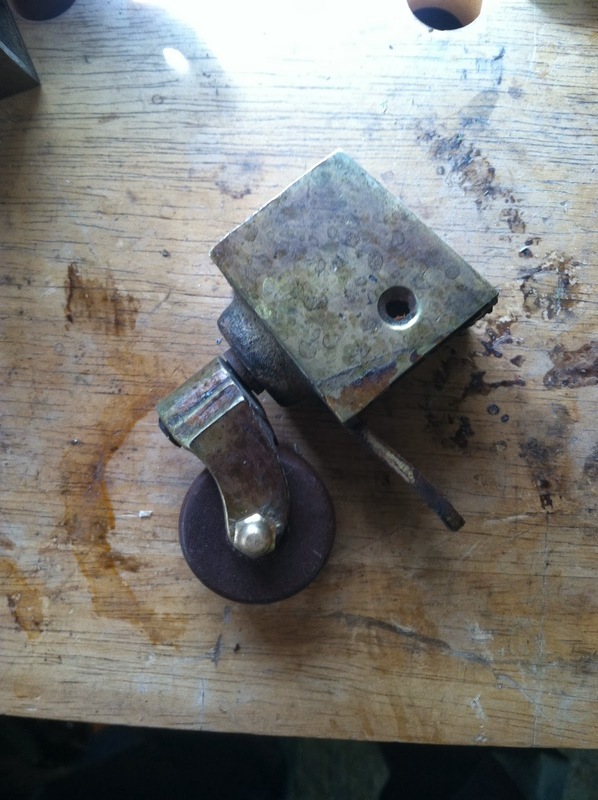 Once the repairs were made the apron and legs were reassembled with new glue and attached to the top. Several photos of patches being glued in place are seen following the photo below. 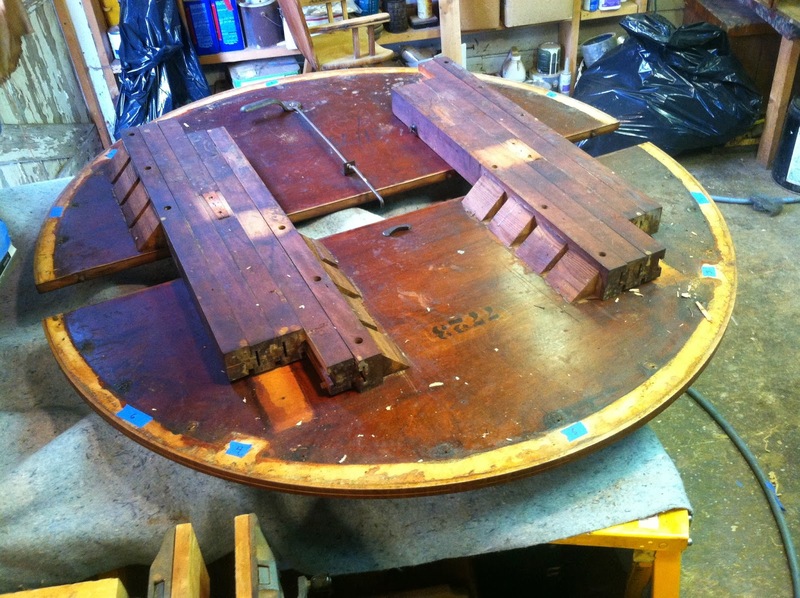 Once the table was reassembled, new glue blocks were installed where the legs meet the inside of the apron where necessary to help add support to the legs. 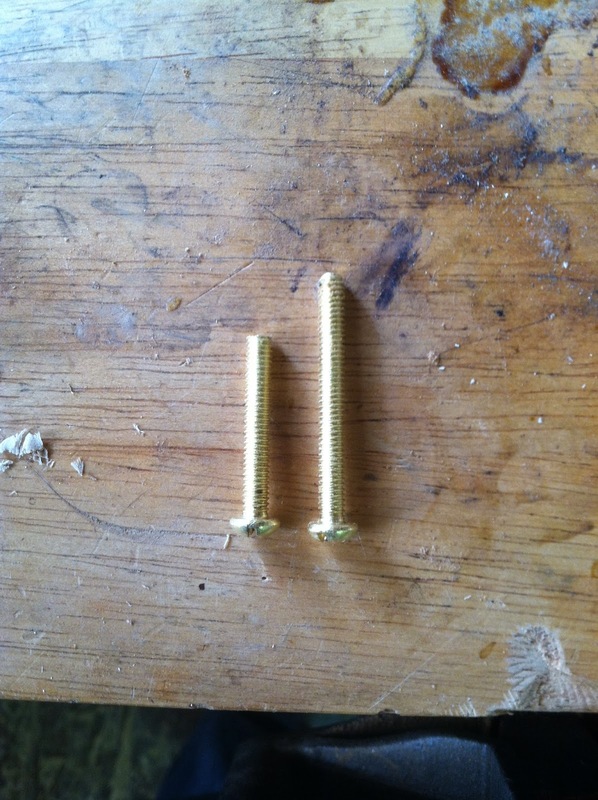 These can be seen in the photo below on either side of the leg. A small amount of the banding was missing in places. 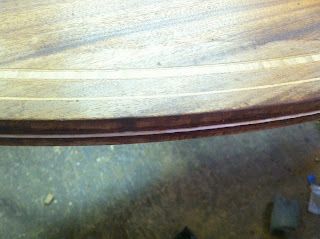 Replacement banding was glued in place as seen in the photos of some replaced edge banding below. As stated above, there was a fair amount of loose veneer on the table. 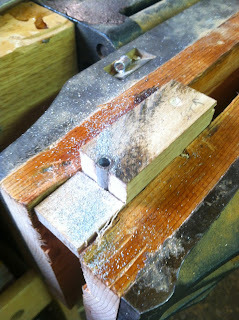 The old glue was cleaned out from the veneer and new hide glue used to glue it in place. 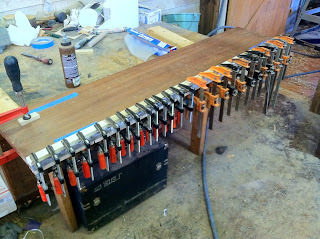 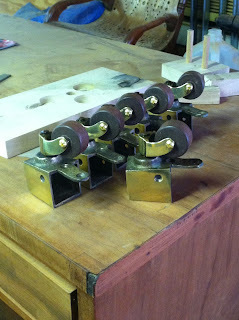 While the glue dried, the veneer was held in place by what looks like an excessive amount of clamps. 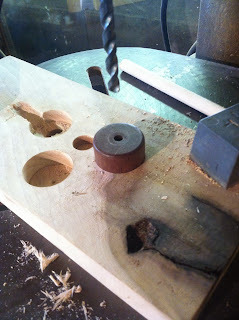 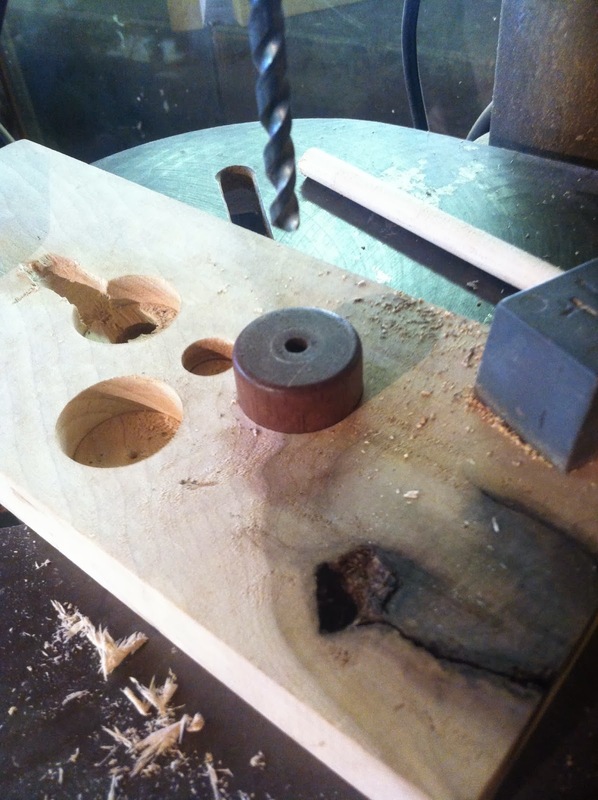 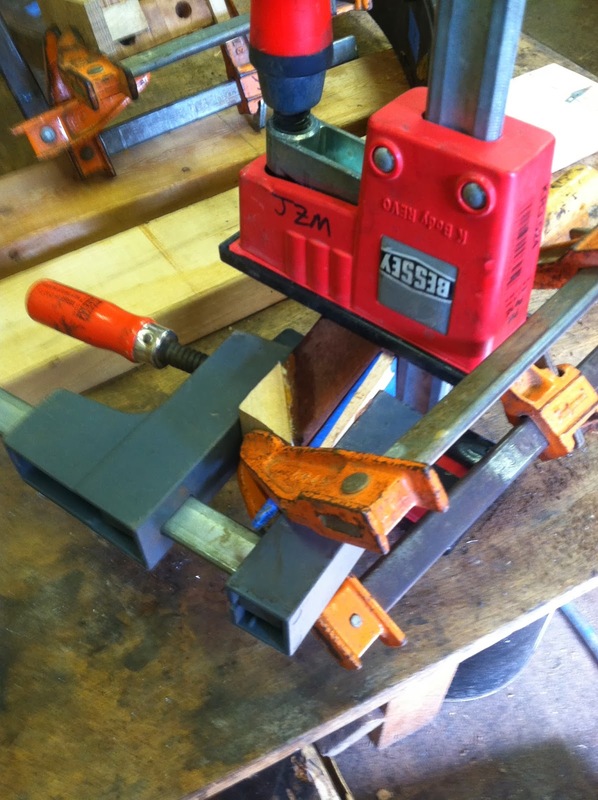 This clamping helps insure that there are no bubbles in the veneer and that it laid flat. 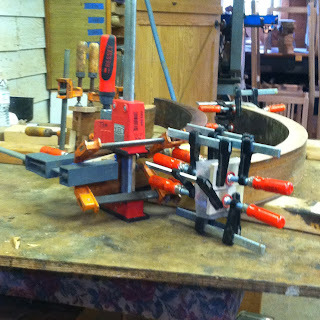 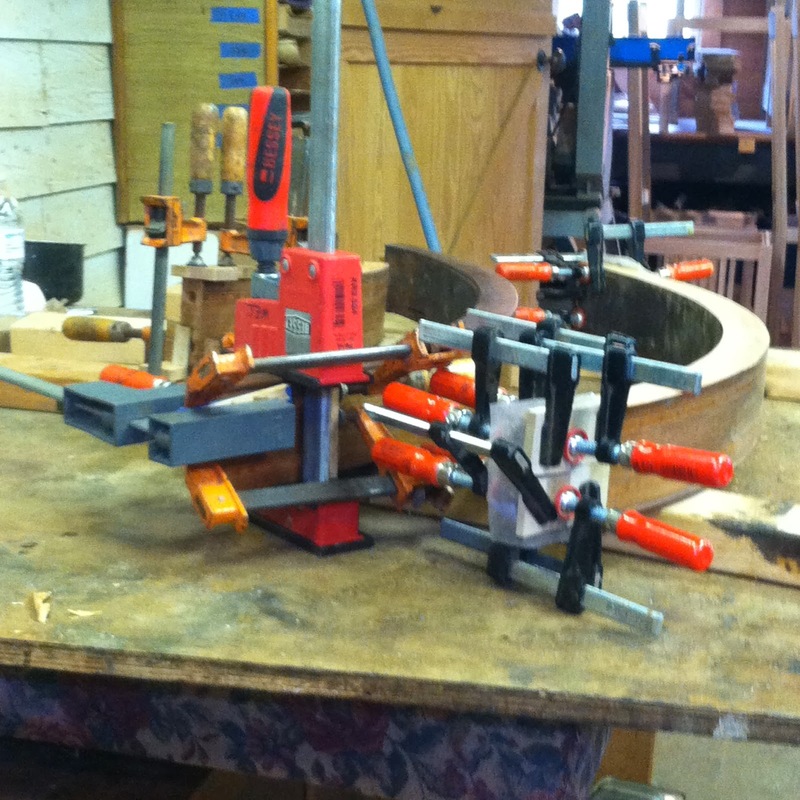 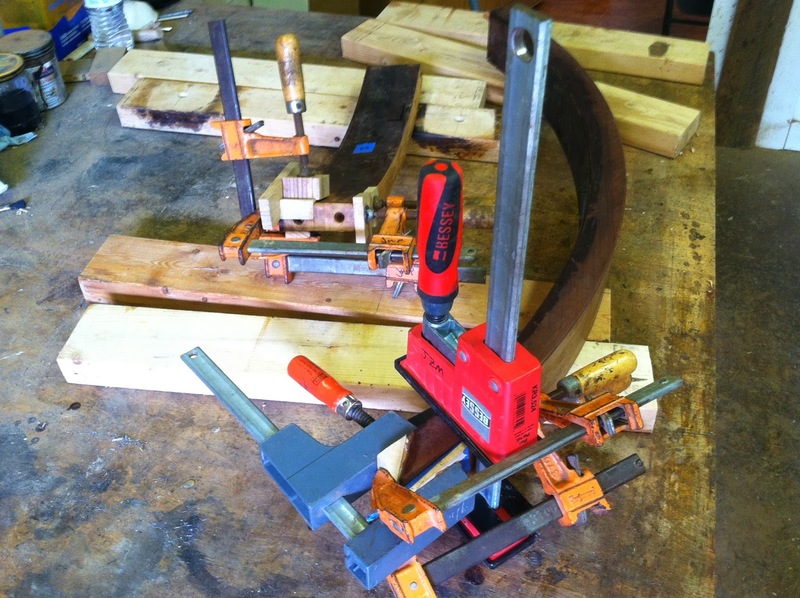 Sometimes so many clamps are used that it is hard to see the furniture that they are clamping! 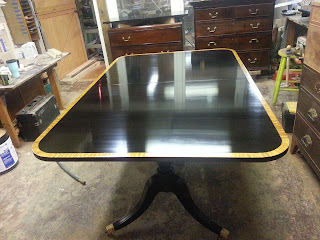 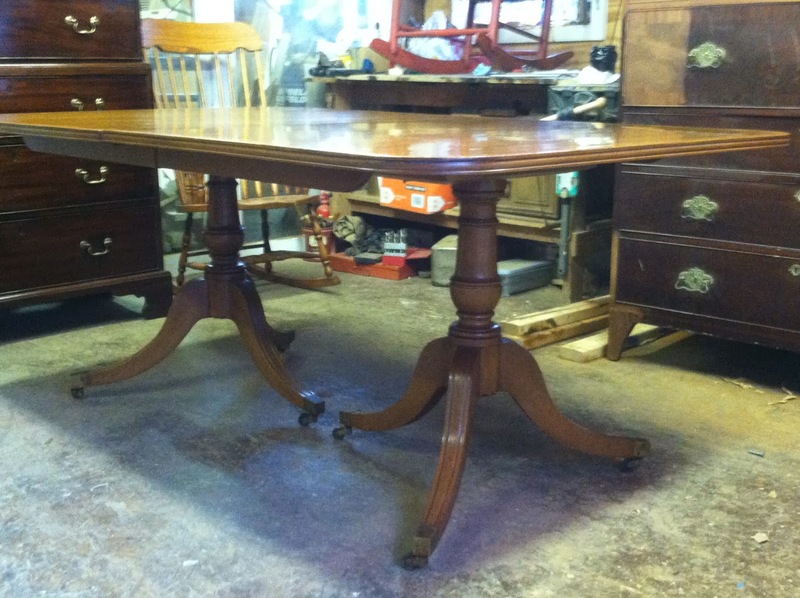 Once the repairs were completed, the table was sanded and a French polish was applied. 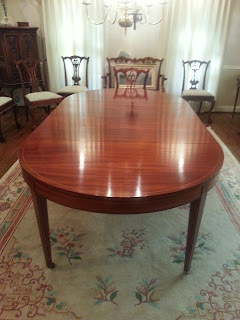 The natural color of the mahogany was stunning and the table was stained selectively to match that color.